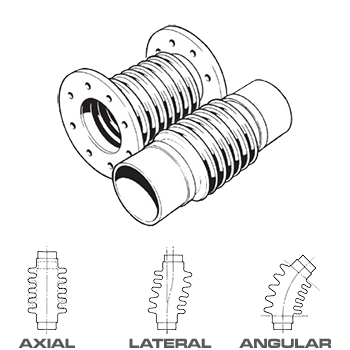 A single metal bellows element fitted with fixed flanges, floating flange or pipe weld ends for use in absorbing movements in pipelines. The joint has no movement restraining hardware attached. Internal flow liners can be fitted to assist with obtaining a smooth flow and to minimise friction losses. Where vibration absorption is a consideration, the bellows element can be constructed from more than a single ply of material i.e multi-ply. The amount of movement is dependent upon the number of convolutions in the bellows element. Movements stated are for non-concurrent movement (i.e. each type of movement occuring independently). Consult RADCOFLEX if movements are to occur concurrently as movement capabilities will be impacted.